In short, this is a very appealing release for fans of contemporary music, and another important addition to the ever-growing repertoire of fine Finnish composers in the Ondine catalog. Vie is a new work, from 2007, structured as a concerto for orchestra. This is Tiensuu at his best: pithy, virtuosic, surprising, and expressive. Kari Kriikku and John Storgårds - who premiered the work in Glasgow - provide a vivid account. À l'image des métamorphoses esthétiques générales en direction d'un certain néo-romantisme, nous découvrons un Tiensuu en cours d'abandon des traits constitutifs en voie de banalisation des travers et tics de moult compositeurs contemporains par trop formatés. (...) Le chef John Storgårds présent sur tous les fronts de la musique de son temps et de sa terre natale, la Finlande, fait montre une fois encore de qualités exceptionnelles, techniques et intellectuelles, à la tête d'un Orchestre philharmonique d'Helsinki bouillonnant et exacerbé. Vie und Missa zeigen Tiensuu als Orchesterkomponisten, der in puncto Handwerk und Inspiration keinen Vergleich scheuen muss. Kriikkus überragendes Spiel ist ein weiterer Pluspunkt dieser CD. Sie ist auch Beleg für einen Trend: Allmählich wird sich niemand mehr der Erkenntnis verschließen können, dass Finnland zu den führenden kreativen Zentren der zeitgenössischen Musik zählt. This release might well be the best introduction possible to Tiensuu's highly personal sound world. (...) They help considerably in appreciating his evolution over the last few years. Missa (...) certainly gives Kriikku the chance to display all his tricks, from multiphonics to multi-tonguing, and from one extreme of register to the other, with quarter tones thrown in along the way. (...) Vie (...) generates some very striking textures within a formal scheme that manages to be both satisfying and quietly unconventional at the same time. Tiensuu on aina musikanttinen, hauska ja koskettava. Hän tarjoaa riittävästi tarttumapintaa rivikuulijalle ja ylettömästi yksityiskohtia syventyjälle. Vie (...) rast und tobt, sprüht, explodiert in wohlkalkulierten Detonationen, stürmt in kaum mehr als einer Viertelstunde durch alle erdenklichen Höhen, Tiefen, Längen und Breiten und ist bei aller Kühnheit obendrein auch noch äußerst einprägsam (...). Missa, ein ausgewachsenes, knapp halbstündiges Klarinettenkonzert, das (...) dem fabelhaften Solisten Kari Kriikku vermutlich alles an Tricks und Raffinesse abverlangt, was nur einigermaßen auf dem Rohrblatt möglich ist (...) - eine Komposition von hohem Unterhaltungswert, schnurrig, launig, poetisch und sensibel, kurzum ein echter Gewinn wie die gesamte CD. 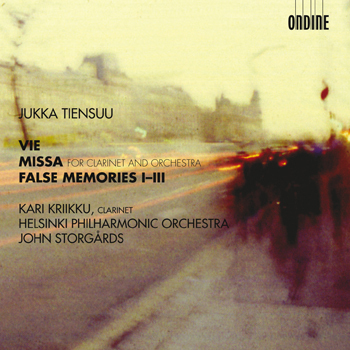 This CD features Finland's star clarinetist Kari Kriikku with the première recording of Jukka Tiensuu's second clarinet concerto Missa, written for him in 2007. Also included are the orchestral pieces Vie (2007) and False Memories I-III (2008) by the same composer. Jukka Tiensuu is regarded as one of the most fascinating Finnish living composer along with Einojuhani Rautavaara, Kaija Saariaho, and Magnus Lindberg. His first clarinet concerto Puro, written for Kari Kriikku in 1989, has since known a phenomenal success, with fifty acclaimed performances around the globe. Kari Kriikku, the muse to a number of Finland's high profile composers, has previously made acclaimed recordings of clarinet concertos by Magnus Lindberg (2006 BBC Music Magazine Award & Classic FM Gramophone Award; ODE 1038-2), Kimmo Hakola (ODE 1063-2), and Jouni Kaipainen, in addition to Jukka Tiensuu's Puro (ODE 778-2). Upon the world premiere of Missa in Glasgow on May 4, 2007, The Scotsman wrote, "Kari Kriikku was the solitary star. His ability to get effects out of his instrument was clearly the inspiration behind Tiensuu's concerto." The Helsinki Philharmonic Orchestra is led on this disc by their chief conductor John Storgårds, who has made several award-winning recordings of contemporary music.